The Chicagoland Corvair Enthusiasts (CCE) welcomes you to the 2019 CORSA Convention from July 23-27, 2019, at the Pheasant Run Resort in St. Charles, Illinois. You may remember this excellent venue from the 2001 CORSA Convention. Join us for five days of parties, dining, sightseeing, shopping, and, of course, fabulous cars! The themes of the convention are the Fiftieth Anniversary of the production of the last year of the Corvair in 1969 and the Fiftieth Anniversary of the founding of the Corvair Society of America, also in 1969. We hope your summer calendar is already marked to attend the Chicago Convention! Your host chapter, The Chicagoland Corvair Enthusiasts (CCE), traces its history to the 1960s, and it's been going strong ever since. Download your introduction to CCE here. 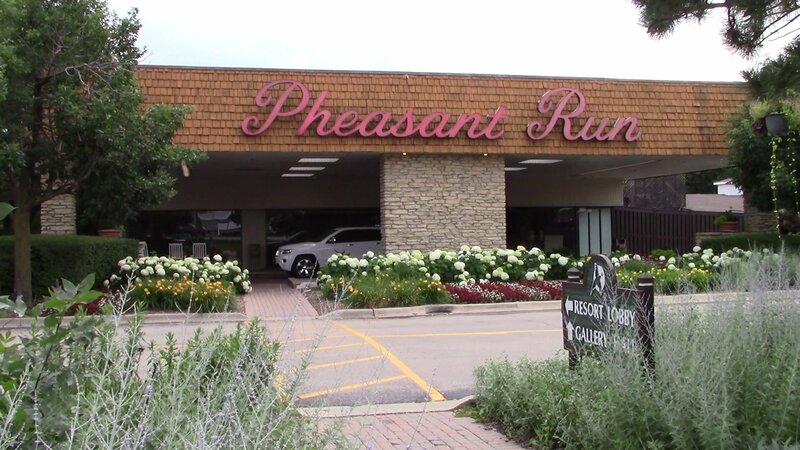 Pheasant Run Resort is located in St. Charles, Illinois, a far western suburb of Chicago, about 38 miles west of the center of the city. Its many amenities include four restaurants, pools, spa, fitness center, hot tub, 18-hole golf course, and more. Local restaurants are just a short drive away. A large shopping center is located just to the northwest of the resort with many fast-food outlets as well as a Target with a grocery store and a CVS drug store. Nearby Geneva has a historic district with many specialty and antique shops. There is ample parking to show off our Corvairs with a separate parking area for trailers and motorhomes. Reserve your room online to receive our special group rate. To reserve a pet-friendly room, please call Pheasant Run Resort directly at (630) 584-6300. It is not permitted to live in campers or motorhomes on the Pheasant Run Resort property. For those who are attending the CORSA St. Charles Convention and wish to camp, arrangements have been made in nearby Elgin, Illinois, at Burnidge Forest Preserve (Paul Wolff Campground). The park is a Kane County forest preserve located about 5 minutes off I-90 at exit 52 (Randall Road). It is under 30 minutes away from the Pheasant Run and offers nice clean sites each with water and electric for only $35.00/night. Reservations are not normally accepted, but special arrangements have been made with Chicagoland Corvair Enthusiasts to reserve a limited number of sites for the week of the event. For details or questions, send inquiries to jlnovak78@comcast.net or call Jim & Lelia Novak at 815.494.1096. Reservations must be secured with the Novaks (not the park) no later than July 3rd. Read more about the Burnidge Forest Preserve and Paul Wolff Campground here. Download the complete activity schedule here. A few highlights are listed below. Registration and Concours Classification. Registration opens on the first day of the convention, with classification for the Concours being held. Car On Trial. The Corvair Preservation Foundation will present a showing of Car On Trial, an internal GM film presentation that was produced in the late 1960s, designed to educate lawyers in how to handle lawsuits relating to alleged design flaws concerning the Corvair automobiles. Concours d’Elegance. The Concours d’Elegance will be held on the grounds of the Pheasant Run Resort. It will not be necessary to leave the property to participate in or view the event. Chicago Architecture Boat Tour. The architecture in the City of Chicago is spectacular! What better way to see and learn about some of our most famous landmarks! Join us for a cruise on Chicago’s First Lady Boat for the Chicago Architecture Center River Cruise. This tour is a must for out-of-towners and Chicagoans alike. Certified volunteer docents will interpret more than 50 buildings along the Chicago River. In a very informative 90 minutes, you’ll get the real story on Chicago architecture and its history. Chicago-style pizza from Gino’s East Pizzeria will be served for lunch. Economy Run and Road Rally. The Economy Run and Road Rally will be held on the same day, one in the morning and one in the afternoon. They will start on or near Pheasant Run and will travel over roads around the St. Charles/Geneva/Fox River area. The courses will be different. Book Discussion. Author Jonathan Rintels will join us for a discussion of his book LifeMobile, the story of a father and a son who strengthen their relationship while restoring a Corvair. To register for this event, contact Donna Naymola at cceconvention@comcast.net. Autocross. The Autocross will be held in a large parking lot on the grounds of Pheasant Run. The parking lot is a short walk from the hotel buildings. The lot is completely open with no curbs, parking bumpers or light poles. The pits and marshalling area is another smaller parking lot just north of the main Autocross course parking lot. Local shopping day. A chartered bus will take you on a short but scenic drive to Geneva, Illinois, just across the Fox River. Downtown Geneva’s environment is that of charm and character, featuring locally owned and operated shops and restaurants. Foremost among these is The Little Traveler, a Geneva landmark. This Victorian home boasts thirty-six rooms of treasures as well as a café where you can enjoy a light lunch. At 2:30 p.m., we will meet at The Little Traveler to board the chartered bus and return to Pheasant Run Resort. Awards Banquet. Dinner will be served. Scoring for the competitive events will be announced, and trophies for these events will be presented. Car Display. The Car Display will be held on the grounds of Pheasant Run, most likely on the same venue as the Concours. Other events, not yet firmly scheduled, will be a Welcome Party, Valve Cover Races, Model Car Concours, CORSA Annual meeting, Indoor Vendors, Outdoor Swap Meet, Tech Sessions and a variety of Tours. There will also be meetings for various special interest groups within CORSA. Convention participants can register to compete for the Edward N. Cole Award. Ed Cole was considered the Father of the Corvair. The Ed Cole Award is presented to the convention registrant who cumulatively collects the most points in the competitive events of the Concours, Economy Run, Road Rally and Autocross. Please refer to your March 2019 CORSA Communique for a complete listing of events. For any additional information, please write to cceconvention@comcast.net. Registrants for competition events must be CORSA members. The convention is planning some child-oriented events (more information to come). We're looking forward to hosting all of you at Pheasant Run Resort next July!